Mulukhiyah, Mulukhiyya or Malukhiyah is Arabic for leaves of the jute plant (or related Corchorus species. 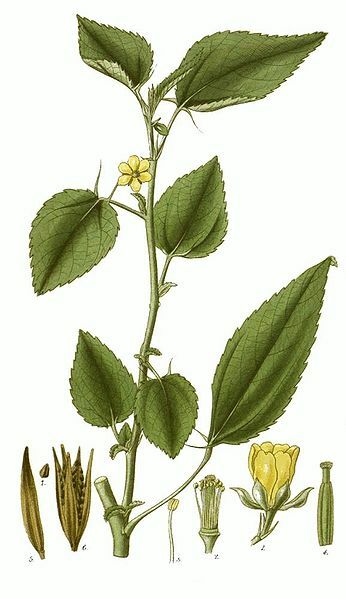 They are of the genus Corchorus, a herb in the Linden family. The green vegetable is commonly used in Middle-Eastern, mainly Egyptian cuisine and is also used in some Far-east oriental dishes (such as in Japan). 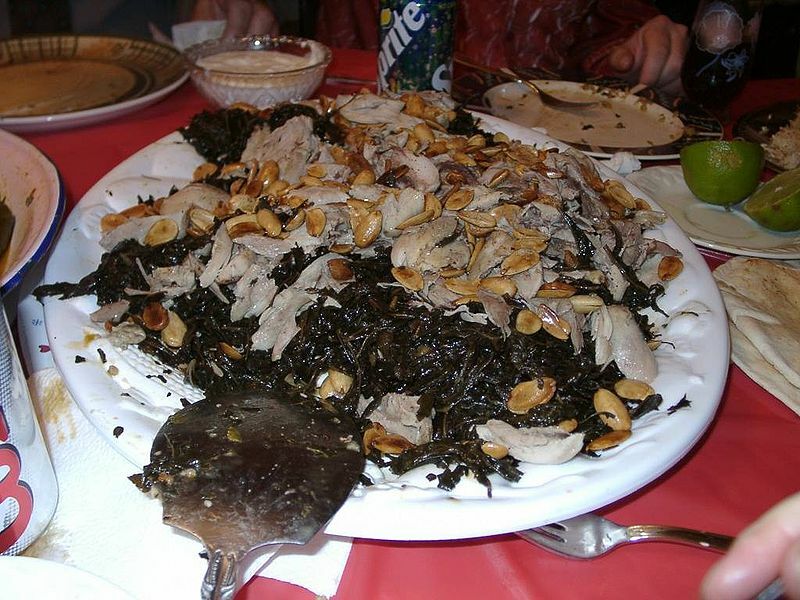 Left: Syrian Style Mulukhiyah with Chicken. It is a rather bitter herb with a natural thickening agent. It is the main ingredient of a popular Egyptian dish by the same name. Malukhiyah is prepared in various styles: the original Egyptian style wherein the mallow leaves are very finely chopped, with ingredients such as garlic and coriander added to give it a characteristic aromatic taste, or the Lebanese, Palestinian, Syrian and Jordanian style where the leaves are used whole. "Malukhiyah Stew" is served with rice, but usually enjoyed with chicken. "Chicken & Mallow leaves stew" is a popular dish in Syria, rabbit is substituted for chicken in the Egyptian version of the dish. Malukhiyah has been known as a popular food in Egypt since the time of the Pharaohs, and later spread to the Levant. The leaf is a common food in many tropical West African countries. It is believed that the "drip tips" on the leaves serve to shed excess water from the leaf from the heavy rains in the tropics. It is called Kren-Kre in Sierra Leone, and is eaten in a palm oil sauce served with rice or cassava fufu, or is steamed and mixed into rice just before eating a non-palm oil sauce. Many Egyptians consider Malukhiyah to be the national dish along with ful medames and kushari. The leaves are rich in betacarotene, iron, calcium, and Vitamin C. The plant has an antioxidant activity with a significant α-tocopherol equivalent Vitamin E.
In the English language, the leaves are called Jew’s mallow. Left: Corchorus olitorius (jute plant).